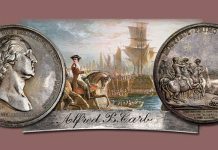 On Thursday, November 15, 2018, Legend Rare Coin Auctions will conduct the 29th in its series of Regency Auction sales. 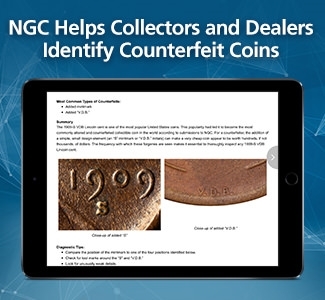 The series, which has been built on the premise that auctions featuring only curated, high-quality coins provide discriminating clients a better way to build collections, has taken off and landed the company a solid clientele comprising of some of the hobby’s most prominent collectors. Having reviewed every single Regency Auction, we have to note that it was difficult singling out the most important lots in this offering because there were so many noteworthy pieces. 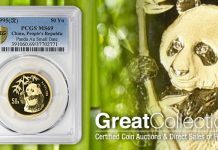 This might prove to be one of the more memorable sales in the series, with important coins from SS Central America leading a 486-lot lineup of conditional rarities and important Set Registry additions. Many of the lots are CAC approved. The live auction will take place at the Hyatt Regency San Antonio Riverwalk at 5:30 pm Central (4:30 pm Eastern). 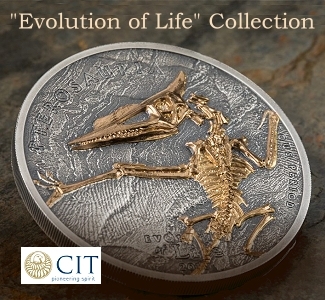 You can watch the auction and bid online by registering on the Legend Rare Coin Auctions website. 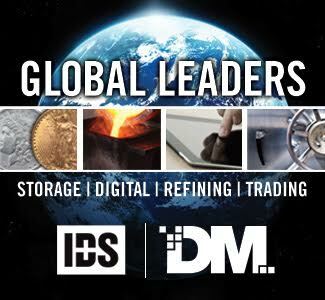 Legend is offering 16 pieces from SS Central America in this sale. 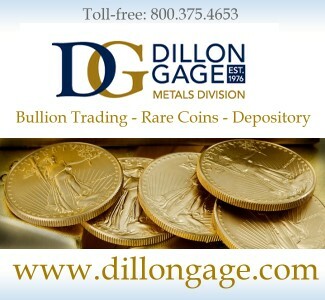 Denominations range from $1 gold to a $20 U.S. Assay gold piece. 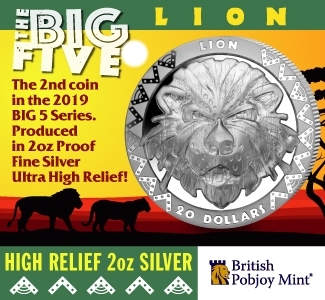 These coins are of unquestioned quality and should be reviewed by any serious collector of these series. 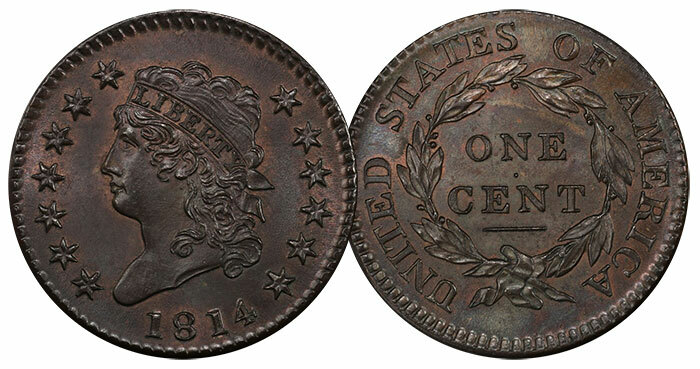 Lot 273 is an 1856-S in PCGS MS64 CAC. 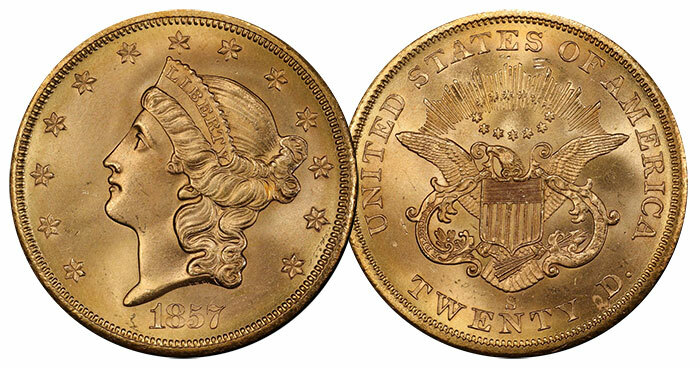 This issue has a mintage of 24,600 and is the only 1856-dated gold dollar to feature the Small Head design. This example is one of five graded by PCGS at the MS64 level. Only two coins grade finer and both of these examples come from the recently recovered cache of SS Central America coins. The fields on this coin are commensurate to the near gem grade. There is a slight bit of weakness on the reverse. Adding to the coin’s intrigue is the presence of clash marks and die cracks. Pre-Sale Estimate: $80,000 – $90,000. 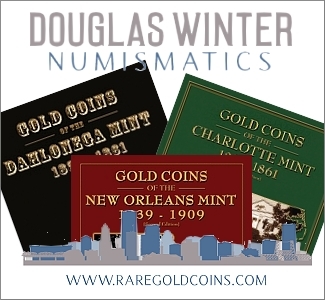 All 1857 $10 gold issues are scarce, with New Orleans issues being the most difficult to find in uncirculated grades. 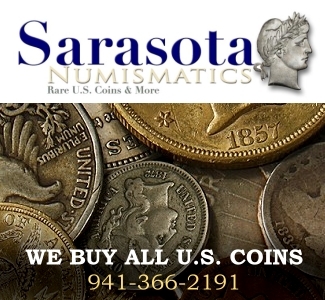 The 1857-S, with a mintage of 26,000, dwarfs the 1857-O’s 5,500 $10 coin emission, but in uncirculated grades the two branch mint issues are equally rare in Mint State. The example offered at the Legend sale (Lot 279) is graded MS64 and is CAC approved. 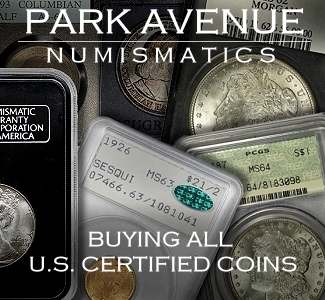 The coin is one of eight Mint State examples certified by PCGS–one of three in MS64–and is second only in condition to another SS Central America piece. That coin graded a tick better at MS64+. Pre-Sale Estimate: $60,000 – $67,500. Current Bid: $57.500. 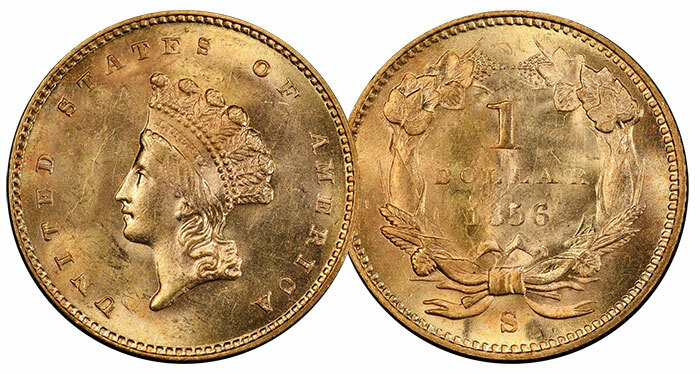 No coin issue benefited as much from the recovery of SS Central America as did the Type 1 double eagle–specifically the 1857-S. 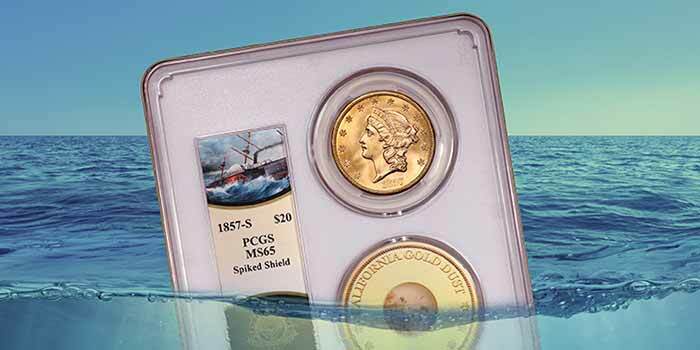 This was a very difficult coin type to collect in Mint State grades, but thanks to the shipwreck, a number of San Francisco issues from this period were made available in number. 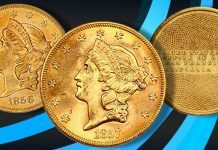 This availability, of course, propelled the series forward and enticed a new generation to collect classic U.S. gold coins. Undoubtedly, one of the finest 1857-S Liberty Head double eagles in existence, this example (Lot 285) from SS Central America is graded MS67 by PCGS. The coin is a few light flecks away from the MS68 grade and is one of four superb gem 1857-S $20s to come from the second tranch of recovered coins. Astute variety hunters will note the “Spiked Shield” reverse. Pre-Sale Estimate: $165,000 – $180,000. 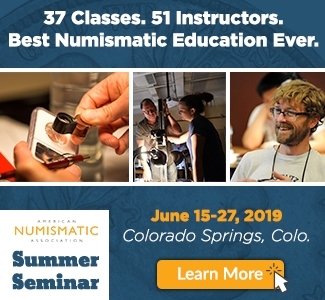 Large cents of the Classic Head type are generally more difficult to find in high grades than 19th-century Draped Bust cents or the Matron Head type that followed them. Based on this fact alone, the 1814 cent offered in Legend’s Regency 29 is one of the finest known. It is the finest graded by PCGS with the BR attribution, and finer by one point over the sole example that PCGS has graded RB. 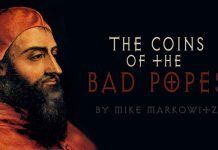 The 1814 cent is virtually unknown with any original Red color. The Lincoln cent may be the coin that popularized penny boards for generations of collectors, but it is a series that is much more than it appears at first glance. 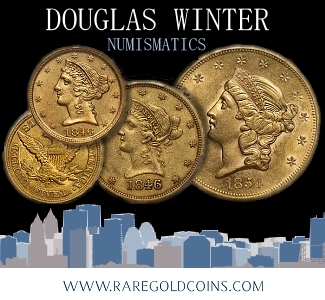 Awash with curious rarities, the 100-plus-year-old series has proudly held the title of the quintessential modern coin of the U.S. series. 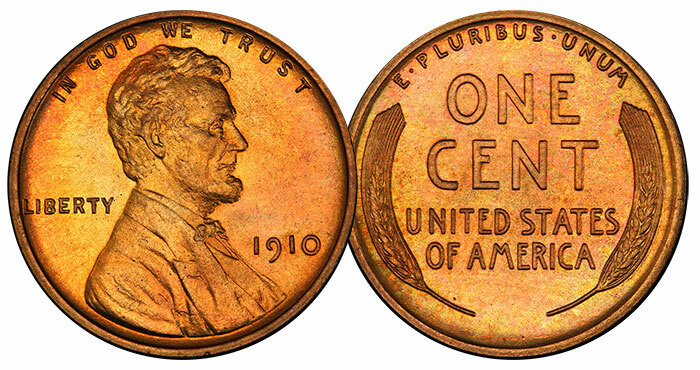 The most fascinating, and arguably the most difficult subsection of the Lincoln cent series to collect, are the matte Proof issues of 1909-1916. The 1909 matte Proof is many degrees rarer than the 1909-S VDB. Quality matte Proofs of later dates are also exceptionally scarce. This example from 1910 (Lot 42) appears as if it were just minted. 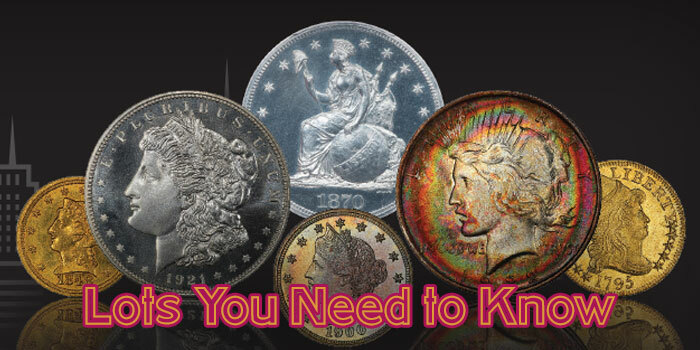 The coin’s original red color exhibits only the slightest hint of mellowing over the course of the past 108 years. Its surfaces are pristine and the full character of Victor David Brenner’s design is struck boldly. 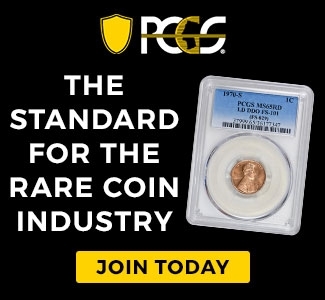 Of the 2,405 examples struck, only six have earned the grade PR67 from PCGS. This PR67+ is one of two top population pieces in their condition census. In August 2018, Heritage Auctions sold the other example for $31,200. A strong case could be made that this example is the better of the two and we anticipate that bidding will reflect that. 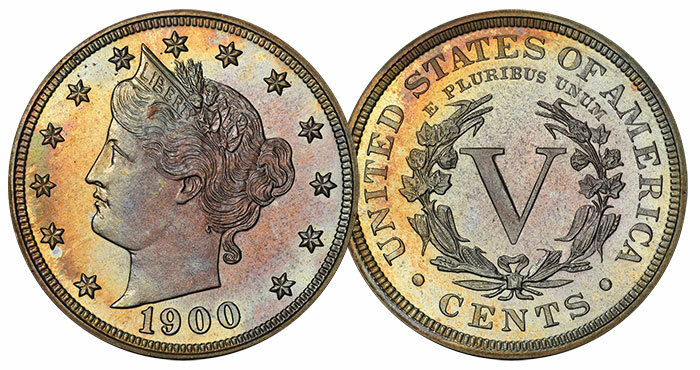 After a short introductory run with the Shield design, the nickel five-cent denomination really came into its own with the release of Charles Barber’s Liberty Head or V-Nickel design. Produced for circulation from 1883 to 1912, the type is best-known for the five examples dated 1913 that trickled out thanks to the shrewd machinations of U.S. Mint employee and ANA member #808 Samuel W. Brown. 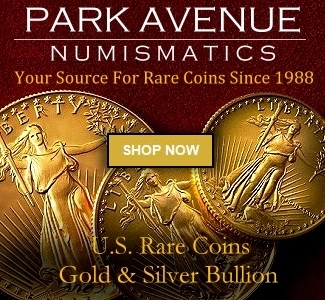 But relegating this 30-year-long series to five virtually unobtainable coins is a disservice to a design that sparked the imaginations of millions of coin collectors and paved the way for the continued use of a denomination that has withstood the test of time. 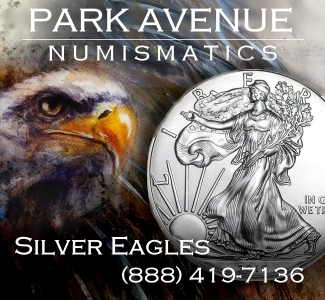 Those wishing to build a nice collection of Liberty Head nickels are presented two equally desirable possibilities: a business strike set can be built in Mint State with both 1883 types and the two branch mint issues struck in 1912; a second set can be built around Proof strikes, which were struck at Philadelphia from 1883 to 1912. This latter set accounts for both 1883 types but does not include branch mint Proofs as none were struck at Denver or San Francisco. 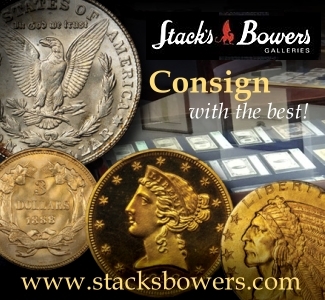 There are no “keys” to the conventional 1883-1912 Proof series, but examples that survive in extraordinary states of preservation do bring significant premiums over issues that have conventional eye appeal. Those looking for a condition census examples would do well to consider the extraordinary 1900 on offer in Regency 29. This example has superb gold, lime, and russet colors, which cover a virtually flawless Proof striking. Detail is sharp and uniform throughout. 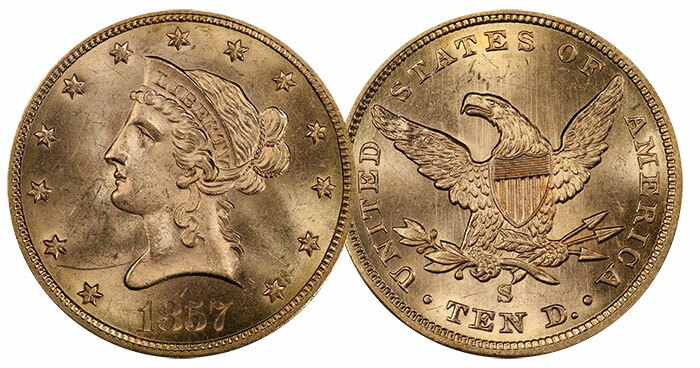 At Heritage’s 2015 FUN US Coins Signature Auction, this example brought $5,640. 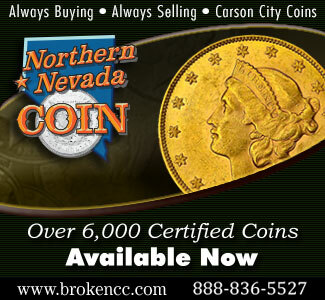 At the time, it was housed in an NGC PR68* holder and was also CAC approved. 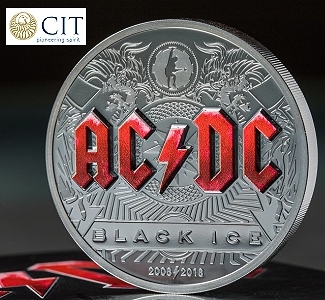 Current bid levels indicate that interest in the coin has elevated dramatically since it crossed over. PCGS gives a population of three at PR68 (none finer with Cameo designation). 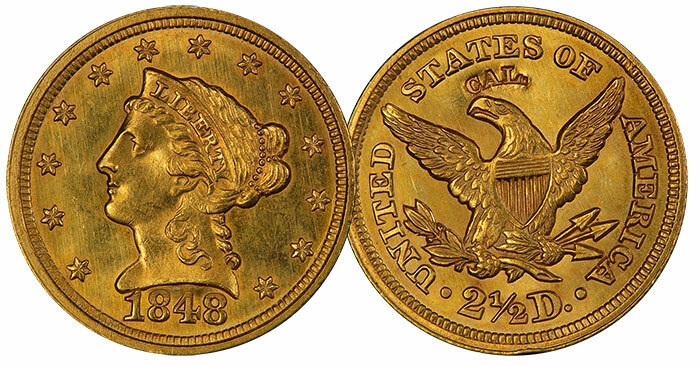 This 1848 Quarter Eagle (Lot 294) is one of the most iconic federal issues struck in connection with the California Gold Rush. The counterstamp “CAL.” was applied to the reverse of the coin at the request of Secretary of War, William L. Marcy. Marcy was in receipt of 228 ounces of California gold, freshly sourced from the newly discovered California gold fields. 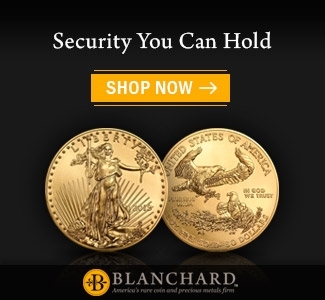 From this gold, Congressional gold medals for Generals Zachary Taylor and Winfield Scott were produced and the remainder was minted into 1,389 quarter eagles. The CAL. 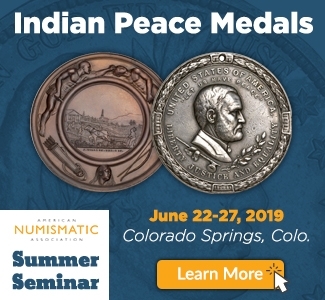 issues were clearly made as souvenir pieces and when seen in this light can be viewed as a precursor to the U.S. Mint’s commemorative coin program of the late 19th and early 20th centuries. 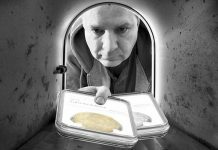 The coin’s appeal goes beyond that, and deservedly so. 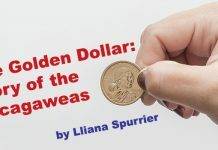 The discovery of gold in California made an indelible mark on American history and is largely responsible for helping the American experiment survive the two decades of suffering and political turmoil that was just around the corner. The present piece is in remarkable shape for a coin graded MS62+. The 1848 CAL is scarce in all Mint State grades and the issue seldom comes to market. This example last’s auction appearance was in January 2011, when it brought $83,375 at a Heritage auction. The coin has since upgraded by half a point on the holder. 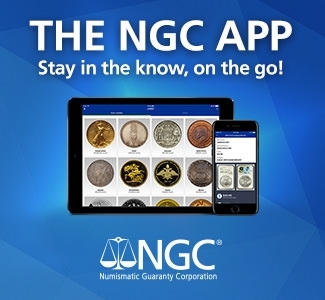 One assumes, based on Heritage’s lengthy description of the piece and the presence of John Albanese’s CAC sticker, that professional numismatists always viewed this coin as being a cut above for the grade.